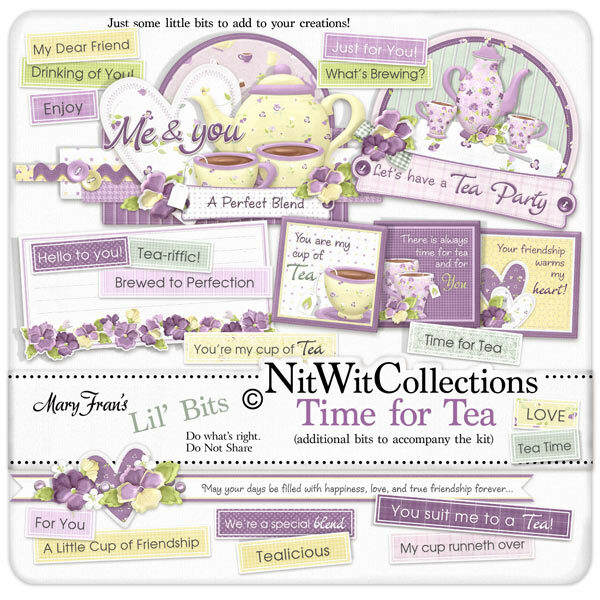 "Time for Tea" Lil' Bits has additional elements and ready made wordart for you to simply add to your layouts and cards. Easy as boiling a kettle of water! Elements in the Lil' Bits are NOT included in the "Time for Tea" FQB. 1 Wordart Square - "You are my Cup of Tea"
1 Wordart Square - "There is always Time for Tea and for You"
1 Wordart Square - "Your Friendship Warms my Heart"
1 Wordart - Invitation style with a border on the base and a lined card for your details! 1 Wordart - "Me and You"
1 Wordart - "Let's have a Tea Party"
18 Wordstrips with many inspiring sayings and words for friendship, tea party and love.